A first class relic of Saint Josephine was present throughout last night’s (Fri) National Service of Prayer at St Chad’s Cathedral. 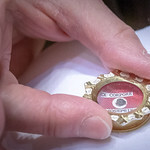 A tiny piece of bone in a small see-through box was observed and touched by many after the ecumenical service, which was organised by the Medaille Trust. It was the second National Service of Prayer the charity, which works to combat modern slavery, has organised, and the event also saw the launch of a six-year ‘Look Up’ awareness campaign between the charity and the Archdiocese of Birmingham. 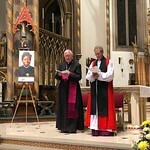 As part of this call to action Garry Smith, CEO of the Medaille Trust, and Archbishop Bernard Longley, signed a pledge to work together for the benefit of those suffering from modern slavery. This large poster - featuring the portrait of Saint Josephine, patron saint of trafficking victims – will now be displayed in Cathedral House. For the first time the Band of the Birmingham Salvation Army Citadel performed at St Chad’s Cathedral, and their music was a fitting accompaniment as the service unfolded. Guest speaker, the Rt Rev Dr Alistair Redfern, spoke movingly about his long association with those involved in human trafficking. He told the congregation of two incidents of modern slavery in Derbyshire - in which forced labour, exploitation, prostitution, threats and physical brutality had all been present. Two stories in which people were being abused ‘right under our noses’. “We have to see too,” he said. “It is very hard for the police to pick this up and respond. They need our help. Rev Redfern spoke of four words which dominate modern slavery: poor; captives; blind; oppressed. “This is happening in the shadows, and we are not noticing,” he said. “Many of us are blind, we need our eyes opened. “I salute the work of the Medaille Trust. It offers safe spaces. Love, hope, a gentle way into recovery. “We have some great systems, but people need love. They are terribly traumatised and need years to recover. After the service Sister Mary Michael of the Angels, from Our Lady’s Community of Peace and Mercy in Lincoln, Diocese of Nottingham, met with people who wanted to look at, and touch, the box containing the relic of Saint Josephine. The ‘Look Up’ and acknowledge campaign will be highlighted in the deaneries of North Staffordshire, Birmingham Cathedral and Banbury for the first 12 months. Churches and individuals will be encouraged to pledge to support the victims of modern slavery and work together towards the eradication of all its forms. Parishes will be visited by the Medaille Trust and awarded a ‘Make the Pledge’ certificate. Continued activity between the Archdiocese and the Medaille Trust will be ongoing until 2025.